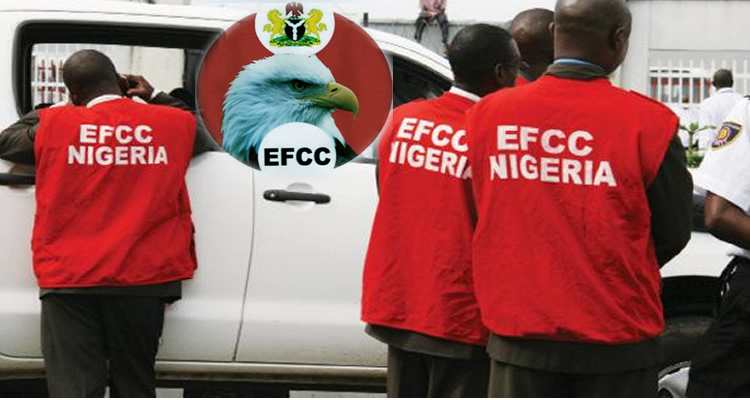 The Economic and Financial Crimes Commission, zonal office in Maiduguri have arrested two of its operatives for corrupt practices. The two yet to be arraigned is being investigated for demanding for money to facilitate a case where they had special interests. A statement from the spokesman of the Commission Jemilu Sale said that under the leadership of its Chief Executive Ibrahim Magu whose zero tolerance for corruption and continual drive to fight corruption both internally and externally they have been recording success in their operations by ensuring that such rotten eggs are thrown away. He went on “On Friday the 19th of January, 2017, this zonal office got information from one of its suspects under investigation that someone posing as a staff of the Commission intimated him on phone about a case under investigation involving him in which the alleged imposter promised to avail him with the original case file on the condition for payment of an amount of money. “The Commission then detailed a team of operatives to investigate the matter. During the investigation, a staff of the Commission one Detective Assistant Habila Dungji Buba and his girlfriend Keron Ayuba Lapips were arrested while trying to make an exchange of the said case file reported in the matter. The release noted that the Investigation into the matter is still ongoing with a view to unveiling more facts on how they intended to finalize the corrupt acts even as servants in the temple of anti-corruption. The spokesman urged the public to report to any of its offices, demands anything by any person(s) regarding information on its cases as a means of interfering with the investigation stressing that victims should report any corrupt practices perpetrated by individuals or organisations. No date has been fixed for arraignment as the investigation is still ongoing. “The fight against corruption is a collective responsibility, everybody is a partner. Let’s join hands and fight corruption,” concluded Jemilu.